Rich in minerals; potassium, zinc and selenium, vitamins; C, B-6, E and K, Amino and Fatty acids, coconut oil offers so much more than temporary relief from minor skin irritations. Soothing and healing when applied, coconut oil absorbs quickly, enabling the skin to utilize all of its goodness. 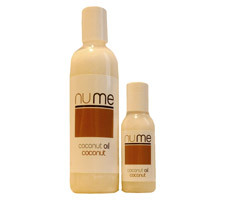 Nume provides you with a wonderful selection of pure virgin coconut oil products infused with organic oils from exotic flora to nourish, deeply moisturise, soothe and calm the body, mind and spirit.